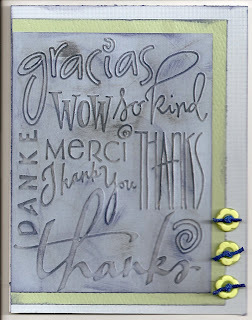 Sketches4All Anniversary Party Blog Hop!! 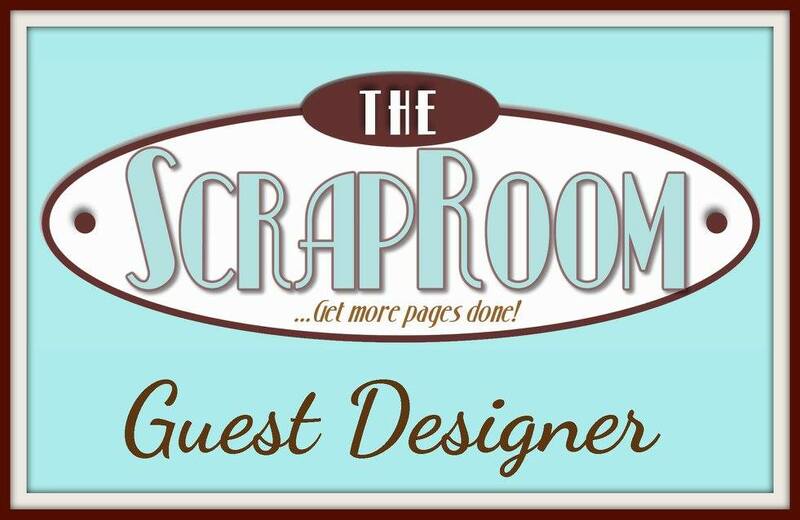 Welcome to the Sketches4All Anniversary Party Blog Hop!! Before you read on too far, make sure that you have started at Mel's blog. If I am your 2nd stop, then you are in the right place. I'm excited to be designing for Sketches4All. It is a wonderful, warm community with tons of fun challenges. I enjoy going there every day and I know you would love it too. I have noticed that many of my followers have joined me over there. So....now it is your turn!! 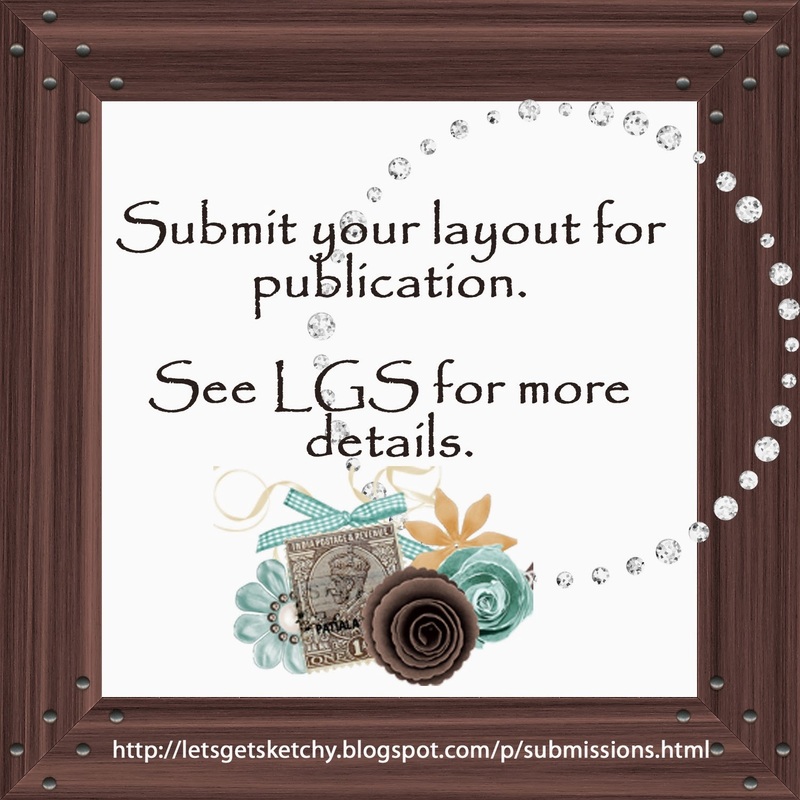 I created this layout using the great sketch for this Blog Hop. If you want to win the main prize for this bloghop (and I am sure you do), then you have to do 4 things. 1) Just hop along to each person on this blog hop and find the hidden letter on each persons blog to solve the mystery word. My hidden letter is A. 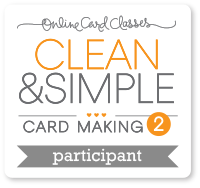 Make sure you leave a comment on each blog as you hop along to get credit. There will be 2 letters on the last blog (Fia's) so be sure and look for both of them while you are there. 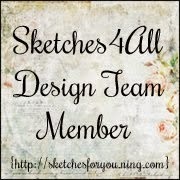 2) Then use the sketch posted above to make your own project and post it on Sketches4All . Don't forget to put in the hidden word you found from our blogs when you post your project. That's it. Easy as pie. To be eligible for the RAK on my blog you must 1) leave a comment, 2) follow me if you want, 3) blog about this blog hop and link back to me. If you actually do the layout and post it on S4A - leave me another comment with the link to your layout in the photo gallery at S4A and you will get a 2nd entry into the random drawing for the winner of my RAK. I will be posting 2 challenges at S4A for this bloghop if you do either of these challenges and post them at S4A, I will give you another entry into my RAK drawing (You will get an extra entry for each of your creations). I will be drawing the winner for this RAK on Tuesday, December 7th. Some of the other design team members are giving away a RAK on their blogs too so don't stop here! Keep hopping along and visit everyone! The next person on the Hop is Michelle so hop on over! There will be other challenges you can enter with RAK's to be won at Sketches4All too. The Sketches4All Anniversary Party is from November 26th until December 6th. 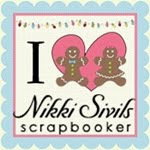 New ending date for the blog hop....Monday December 6th! So that gives everyone more time to join in. So get busy and start hopping!! My RAK includes 10 pieces of 7Gypsies Paper, 4 pieces of Graphics 45 Christmas paper, 1 pkg Tim Holtz grunge paper, 9 Prima cream colored flowers, 1 pkg 7Gypsies Metal Index Tabs, 1 pkg 7Gypsies tags and a few things drawn from my stash, some sparkly green ribbon (string? ), black cord, 4 Tim Holtz Metal Gears, 4 Tim Holtz Fragments, 1 black frame, and some assorted eyelets (red, bronze, black etc). I hope it is enticing enough to get you interested in participating. I'm looking forward to seeing what you all create!! Have fun! My friend, Denise, made the most gorgeous Advent Calendar. You really need to go to her blog and check it out. You will be happy you did!! And if you aren't already a follower ....follow, follow...you will be happy you did. She rocks and inspires me every day. Here are the Prima Picks for December- YUM!! It really is a gorgeous mix of goodies!! You should rush over and enter to win. I'm in the Christmas mood...so today you are going to see Christmas cards. The first one is for my current Anniversary Party Card Challenge at sketches4you. The challenge is to make a "Holiday" card (you choose the holiday) with a Tree on it. Easy enough. And I have a great RAK for the winner. This challenge ends on Monday December 6th. So go check it out. And my final Christmas card was for Jackie's card challenge at Sketches4all. I believe it might end tomorrow too if you want to try to participate in her challenge. As I am in the Christmas mood, I started my Christmas cards. I always add a family picture and we took some yesterday. This is always hilarious since there are 5 kids, 2 adults and the 3 dogs always try to get in on the action. We had a couple turn out okay. I will post one in a few days (or scrap it and post my lo!). Don't forget to join in on the Sketches4you Anniversary Blog Hop (and the party going on over there has challenges everyday and prizes for the winners). You have until December 6th to participate. My silly daughter was making faces for me the other day and I thought I would share them with you. Maybe they will make you laugh too. She is a funny, bossy, little pistol! Her favorite word right now is NO! And even with that I am so lucky to be her mom. I did a layout using pictures of her and thought that it went perfectly with these dorky pictures of her. I started this layout in Washington at CKC and had fun finishing it up here after I decided which pictures I wanted to use. I did some masking on it but you really can't see it in the picture, there are rubons and chipboard. It was fun to work on this layout. Next weekend I am going to Texas to our 15th annual Christmas Party/Family Reunion. My aunt and uncle on my dad's side of the family started hosting it 15 years ago when my husband and I lived in Texas and I have gone every year since and it just keeps getting bigger and bigger. We outgrew my Aunt and Uncle's house and we now have it at a hotel that can hold us all. We all fly in and drive in from all over the USA. And we have a blast. We always have a fun (funny) gift exchange. I can't think what it is called but it is the one where everyone brings a wrapped present and you draw numbers and pick one from the pile or steal it from someone else. I am working on a mini scrapbook of pictures from past Christmas parties that I am planning to take as "my present" this year. Okay, enough for now.... Don't forget to join in on the Sketches4you blog hop which is going on now until Monday December 6th. Happy Thanksgiving and Happy Thursday! We are stuffed to the gills around here. I cooked for 2 days and then we ate and ate today. I made 6 pies and I haven't had a piece of one yet. Still trying to digest the other food. But I am thankful for my family, my friends and good health (mostly-lol). I am posting this layout of my sweet baby girl. These pictures are from when we were in China. We went there last year to finish up our adoption and to bring her home. The picture where she is sleeping is so special to me because she made these sweet sucking noises when she slept. They were adorable and I was pretty happy to get a picture of her doing it. So that is why you see all those pictures of Chinese babies bundled up in fifty layers of clothing! Most of the little babies clothing have a split crotch so they can just stop and have them pee in the street. We saw people doing this. Anyway, this is the coat that dd came wearing to our first meeting. All of the other little girls in our group had similar (or matching) outfits on. They all looked so adorable. I made this layout for an inspiration challenge at sketches4you that Melissa Pablo is having. I mainly took my inspiration from the colors of the picture and from the doodling. I sprayed it with 3 different colors of Glimmer Mist, Key Lime Pie, Peach Delight and Black Magic. I doodled on it with a black sharpie pen. It seems like it would have been easy but it took me a while to make it. It isn't my normal style of scrapping so it was a bit of a challenge for me. I do like how it turned out though. What do you think? And now to end with....this last picture is of 2 of my dogs...(the bean bags are my kids chairs in my craft room/office) Don't they look like they have had a hard day??!! lol Lazy dogs! On Sunday I was sitting in my living room when a bird landed on the backdoor. (on the wood around the glass panels) It was so odd that I took a closer look at the bird. (who just sat there) When I looked closer I realized that the bird was a parakeet. I got up and opened the other door (they are french doors) and the bird didn't fly off. I talked to it and got really close but it flew off. I followed it across my yard to our deck. It was sitting on the wall by the deck and I again tried to catch it. It flew off again...this time up into a very tall tree. I went back in the house thinking...too bad, I can't help the little bird. I told my family about it and my son and I went back out to see if it was still in the tree. It wasn't. We looked around and found it on the ground. It flew back into another tree when we got closer. We stood in our garage across from the tree and talked sweetly to it. Amazingly it flew down to us and into the garage. It landed by our dog crates (empty) and I caught it and put it inside of the smallest dog crate. We brought it into the house. Now, I know that is the long drawn out version but I didn't want you to miss out on all the details (LOL). I caught the bird because I was worried about a domestic bird being out in the wild. It was cold here too. I called our front gate and asked if anyone had reported their bird missing but no one had so I guess we are now the proud owners of a pretty blue parakeet! The kids and I went to the pet store and got a bird cage and all the other things a parakeet needs. The bird was happy to go into the new cage (he/she didn't like the dog crate). And the poor thing must have been starving because it ate and ate. The kids have named him/her Bertie Bird (my 5 year old son's choice) and are super thrilled to have a new pet. I actually combined it with a sketch challenge (which unfortunately I can't actually enter because I missed the part where you can't combine it with other challenges...boo...me) and with a color challenge (blue and brown). I would love it if you joined me on this challenge. And as an added enticement....I will be giving away an awesome RAK to the winner. And if you follow me you know I do good RAKS! Getting close to Thanksgiving....are you ready? Do you have your shopping done? Any of you planning to shop on Black Friday?? I am really a lucky girl. I have a great, loving husband, fun, enjoyable children, tons of fabulous family and friends. I really am blessed with riches of the heart. I want to thank all of my followers especially the ones who sent me special get well wishes while I was out recovering from surgery. Sometimes I don't think we realize how little things mean so much. So thank you all very much I am grateful for your friendship. I want to especially thank my friend, Kelly Massman, we only know each other from online but I feel as if we are extremely close friends. She was so sweet to check on me multiple times, she sent me get well cards and lastly she made me this super sweet Tea Cosy. I got it in the mail recently and just really LOVED it so much. So, I am going to give you a little tutorial on how to make it. Because it is not a hard project and it meant so much to me to receive it. Maybe you could make something like this to show someone in your life that you are thinking of them. 1. I took a 2 sided piece of patterned paper and cut it into an 8 inch square. 2. Then I folded the square in half. 3. I then laid the triangle with the middle point pointing up. 5. I did the same to the left side. 6. Next I took one piece of the top point and folded it down. I didn't glue it and it stays fine but you could glue it down if you want. 7. Next I stamped a sentiment on it. I used a Thank You because I am giving it to one of my children's teachers. 8. I then added ribbon and a flower. You could add whatever embellies you want. 9. The last thing I did was pop in the tea bags. You could put a instant cocoa packet or and envelope of bath beads. Or any number of other items that might fit inside. Mine isn't as cute as Kelly's but I think ds's teacher will love to get it from him. I might even have the kids make their own. It is easy enough that they would be able to do it and probably love doing it. So, there you go....a fun and easy tutorial for your Monday. If you make one and post it on your blog please leave me a link so I can check it out. Look what Kate at http://kateblue.blogspot.com/2010/11/just-token-tuesday-token-of-gratitude.html has to give to a lucky person who visits her blog??!! YUMMY CANDY!! You should check her out and see the other candy she has to give away too. Angela at http://angelwoodcrafts.blogspot.com/2010/11/birthday-blog-candy.html Is having a birthday and wants to share with her friends. So check out her blog and see all the goodness. Her blog candy giveaway ends November 30th so you better hurry on over. Amy at Scrapping Mommy http://www.scrappingmommy.com/2010/11/birthday-blog-candy.html is celebrating a birthday and wants to share the presents with her followers. 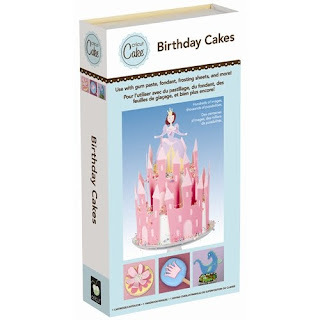 She is offering this awesome Cricut Cake Cartridge as a candy giveaway. You don't have to have a Cricut Cake to use the cartridge. It works in any Cricut. She just wants some organizational tips, so go post some on her blog and enter yourself for the giveaway. You will want to go check her out just for all the great inspiration on her blog. Why is it that most men want applause when they do normal family chores? We both took the same class at CKC and these birthday pictures were all I had printed. So that is why you get to see this birthday layout. I wasn't as ambitious as Denise...I haven't finished up the other half of the two page layout. I had a doctors appointment today and really just wanted to get something new on here for your viewing pleasure. The class was fun. The layouts are fairly simplistic so I went a little crazy with Stickles, a journaling card and alphas. I do like the cheery upbeat feel of the paper. And the colors worked with the pictures perfectly. How was your Thursday?? Get any scrapping done today?? One of the fun things about CKC (other than shopping and taking classes and the crops) is that they have tons of "make and takes". "Make and takes" are basically just what they sound like, a paper craft project that you can either do at the sales booth for free or a small fee and then take it with you. One of my crafty projects I am showing here today is a "make and take" project that I did in between classes last Friday. Most of the pieces were already cut and ready to go. But I did fussy cut the flowers. I came home and got a little carried away adding bling, glitter and pearls. I also put that sweet journaling tag on there and did my journaling. I think it is Sassafras and Co. but I'm not for sure. And I had those fun K & Co. Wild Saffron chipboard alphas in my stash. The girl at the booth was super fun and funny and we really had a ball sitting there, talking to her and doing this layout. We did a couple more "make and takes". One was at the Tattered Angels booth. It was really mostly just playing around with their new product (for free). And the other one was so super cute that I ended up buying four more of the kits to take home and make! They were cocoa packet holders. The sweet snowman is so adorable. I thought they would be great projects for my kids to make for their teachers for Christmas. What do you think?? I know that everyone has been DYING for me to FINALLY pick a winner (oops...I mean the winners. ha) So guess what??? I did it and now I have the 7 lucky names written down on the notepad by me. Do you want to know??? Do you??? 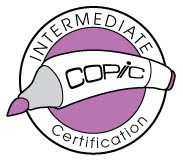 I'm kind of challenged with figuring out how to copy and paste into my blog posts so bear with me as I type out what each of the winners has written to me in their comments. There are 6 more winners!!! Congrats Cheryl!!! Woo hoo!! Same requirements.....email name & addy to me by next Tuesday the 23rd of November or I will pick another winner. Jenny said...Hi Stacy. You are so sweet and generous to do this giveaway. I'm already a follower and I posted about your blog candy on my blog. Thank you for all you do and have a great weekend. Take care. Jenny L.
Isay said...WOWSER!! what an eye candy?! all TIM!! thank you for your generosity. 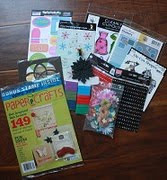 I am now a follower and here is the link to my blog http://isay-creativegenius.blogspot.com/2010/09/stacys-tim-holtz-giveaway.html those are some serious yummy goodies! thanks for the chance to win and God bless. Rbarakat said...Wow - I am a follower and just posted about your blog candy - it will post on the 4th. Lucky me, your deadline was extended. I am so sorry to hear the about why though. This is disheartening. I will be praying for a fast recovery whatever it is - I am glad you went to the doctor. Hang in there. Congrats to you too Rbarakat!! So there you have it my 7 winners. I wish I could give you all something. Thanks again for following along and for all the kind words. I am planning to finish out November with lots of posts and something special is coming the beginning of December.... So make sure and check back when you can. And comment if you have the time. I love to hear from you. We flew into Seattle Thursday night and rented a car and drove to Bellevue. We mostly just had dinner and organized our stuff, talked and went to bed. Friday we had to be at the convention center early for SHOPPING! (LOL) They let us in an hour earlier than the "regular folks" (we were "special" because we pre-registered for classes). We only had two classes scheduled but finished most of our shopping early and then had time to kill so we booked another class. By the end of the day, I was exhausted. I guess it was just more than my poor still recovering body wanted to take. When we got back to the hotel we had dinner and then went to the room to organize for the evening crop. I was grumpy because I was tired but Denise was sweet and didn't complain. I made it at the crop until about 10:30pm. We went back to the room and I CRASHED. HARD. We had an early class on Saturday so we were up by 6:30am. (boo)(I'm soooo not a morning person) We knew we would be broke after Friday so we scheduled 4 classes on Saturday. After all our classes we went back to the hotel (tired again but not as tired). We had dinner and coffee (caffeine was our friend) (ha). Then we got ready for the Saturday night crop. For some reason I got my second wind and was in a super happy upbeat mood. And we had some really fun girls at our table. The night was a blast. Denise and I both won good prizes and got goodie bags at the door. I did a layout for Scrap Our Stash and earlier that day I had won this adorable "Monkey" book so I decided to work on that. We slept in (sort of) on Sunday, packed up our stuff and flew home. Ahhhhhhhhhhhh, such fun...thanks Denise for letting me tag along with you to my first scrapbook convention! It was awesome! I can't wait to go again!! 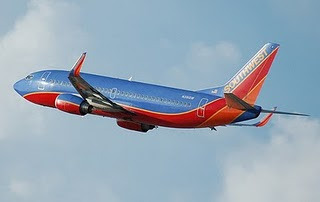 Okay, today I hopefully flew successfully to Seattle with my friend, Denise and am now in Seattle at our hotel. I actually just recently got a Cuttlebug (yes, I am behind the times....lol) and I wanted to try it out. 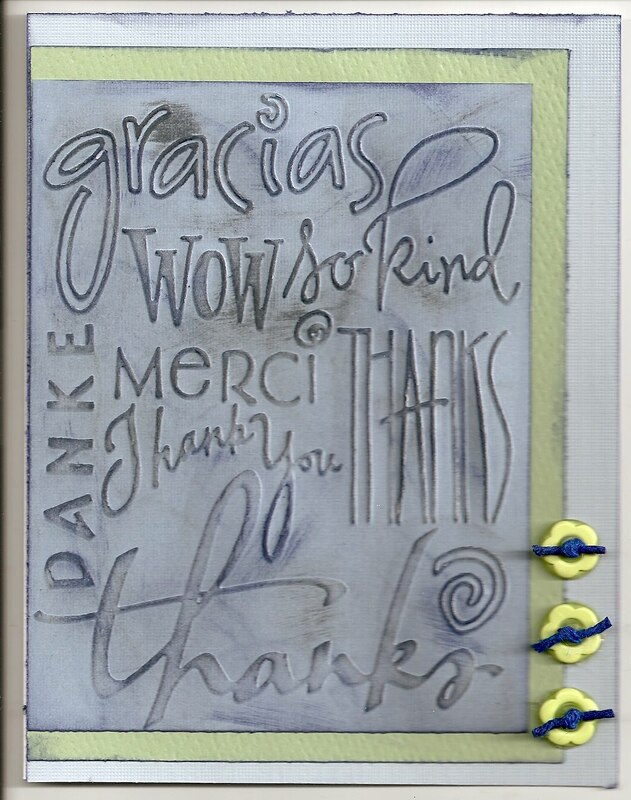 I have this fun Thank You embossing thing so I tried it out. Do you have a Cuttlebug or some similar machine?? If so, do you use it as much as you thought you would?? I am also posting a crafty creation for the first time in a long time. 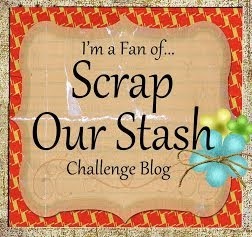 I made this layout for the Pagerize This challenge at Scrap Our Stash (link on sidebar). I took the picture at my ds Harvest Festival at school. He had just had his hair painted in red and blue stripes and I had just gotten this great kit in the mail in those exact colors...it was just meant to be. I will have at least one other autopost for while we are gone. Have a great weekend!! This will stay at the top of the blog for awhile...please tab down to see current post. 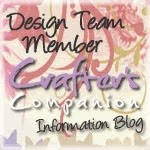 Yes, you read that right....a NEW TIM HOLTZ Merchandise blog candy giveaway!!!! I have been feeling a little blessed and a little guilty. Blessed that I have such a loyal following and guilty because I haven't been around much lately and you are all still visiting!! You will only have to do the usual to be entered to win. And what is that you ask?? 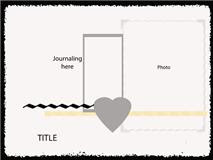 2) leave a comment with a link back to your blog. 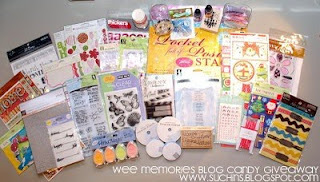 3) link back to my blog candy giveaway from your blog. 4) post about this giveaway on your blog. You will have until November 21st to contact me if you win...after that I will pick another winner. If someone international wins (someone not from the U.S.A), I will NOT be sending the Ranger Enamel Accents or the Ranger Distress Crackle Paint. I will exchange them for two items of equal value. I do not want to mail liquids internationally. So there you go - my gift to you. I can't wait till you start commenting and I get to go look at your blogs!! The same rules will apply and each of these additional winners will need to contact me by November 7th and give me their mailing address or I will choose a new winner to replace their name. The candy will be a surprise but a good surprise! I will still be picking a main winner for the big prize so that will be 7 candies given away!!!! I really want to say thank you so much for all the kind words. It really warmed my heart to read all the nice things that were written while I was out recovering from my unexpected surgery. I am so sorry to have been out of the loop for so long but it was totally not expected. I am doing much better and will be fully back to normal by next week. I want to thank my friend, Denise, for letting you know that I was down and out and for extending the deadline for my blog candy. I will be picking all my winners on Monday, November 15th. So all you stragglers better get yourself signed up!! lol I have a lot of great stuff all ready and waiting to be mailed to my lucky winners. Isn't the suspense killing you??!! I, unfortunately, haven't been able to scrap at all. So you will have to bear with me as I get caught up on things. This is Denise, a friend of Stacy's. Stacy has been in the hospital and has been unable to use the computer. She is home now, but is still recovering. She has asked that I extend the giveaway until she can get back to normal. The new date will be November 15th. I don't want her to worry about it and try to move around too much. Thank you so much for your understanding. I'm sure she would love to hear from people, if you'd like to post an encouraging comment for her to read when she gets back to blogging.